A chicken plate and appetizer at Mistura. Photo from Facebook. Remember back in 2012, after the SF Underground Market was shut down, Iso Rabins launched all those fundraising campaigns for his next venture? Well, there’s finally an update from East Bay Express on where the project will be reemerging. It’s headed to a warehouse in Uptown Oakland, and will be called ~FORAGE KITCHEN~. It will be similar to other incubator/commissary kitchen hybrids, but Rabins has also borrowed some ideas from “co-working spaces.” The word maker is being used a lot, for starters, but it goes beyond that. Would-be chefs can join for a monthly fee, and Rabins also hopes to bring people in for workshops, like an “Ask a Lawyer” night where people can ask for legal advice and share the cost. He is partnering with his cousin, Matt Johansen (one of the founders of Biergarten), and the plan is to open in September—we will of course let you know when things are close. 478 25th St. at Telegraph, Oakland. 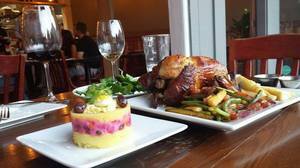 East Bay Express reports that a new Peruvian restaurant has opened in Oakland, called ~MISTURA~. Owner Daniel Luna is an Oakland native of Peruvian heritage and is serving a small, tight menu with a couple of potato appetizers and salads, plus lomo saltado and rotisserie chicken. Hours are lunch Sun-Fri 11am-2:30pm, dinner daily 5pm-9pm. 3858 Piedmont Ave. at Rio Vista, Oakland, 510-652-1439. As part of their summer series highlighting the regional cuisine of Mexico, ~DOÑA TOMÁS~ is serving a special dinner inspired by Mexico City on Wednesday July 1st. The dinner consists of three small courses, followed by a main dish and dessert. The menu includes ancho chile stuffed with seared foie gras, and mole madre in the style of Pujol. Dinner is $55 per person including food; an optional drink pairing will also be available. Reservations can be made by calling the restaurant. 5004 Telegraph Ave. at 51st St., Oakland, 510-450-0522.